Picnics are about fun, taking in the sun, and embracing the outdoors with a childlike mindset, whether you are a kid or just feel like one. 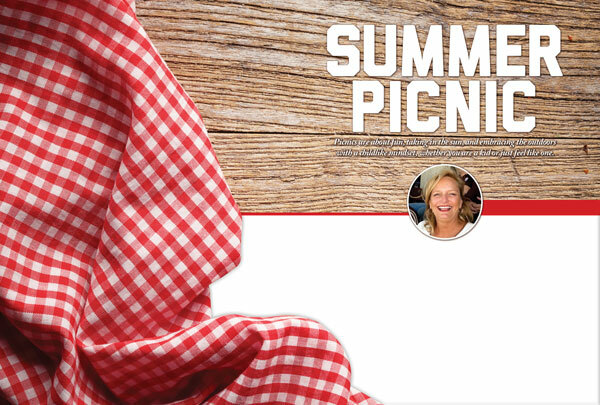 A picnic is about breaking away from the everyday-ordinary, eating with your hands, and leaving behind the proper use of utensils and the usual manners like keeping your elbows off the table. Whether you go out in your own backyard or embark on a hike through the woods to a grassy knoll, you are doing something different, and the destination is not the most important aspect, by a long shot. Choose a place that works for you and your kids. Tiny tots will do best in their own backyard or in a nearby park. Older kids will love to get out in the woods, hike to a pond, or go anywhere that is not a familiar part of their daily routines. Choosing a picnic menu is easy if you keep it simple, keep it age appropriate, and add a bit of adventure to your choices. 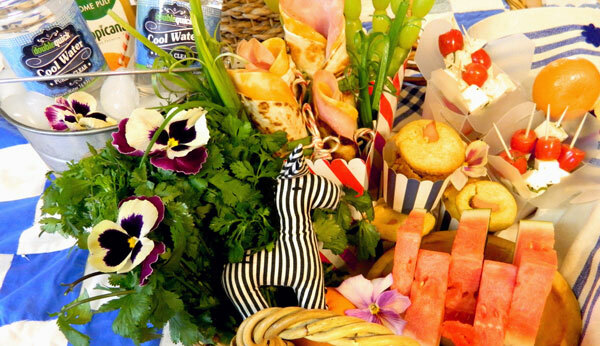 Finger foods on a platter, simply laid out on a quilt, work great for kids. 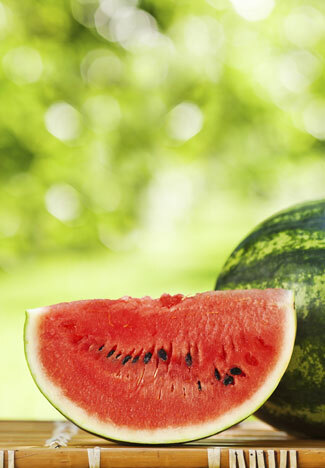 Chunks of watermelon, or green grapes threaded on a skewer, are both fun for kids and simple to create. The same goes for fresh vegetables combined with a bit of tasty cheese and a tangy sauce for dipping. 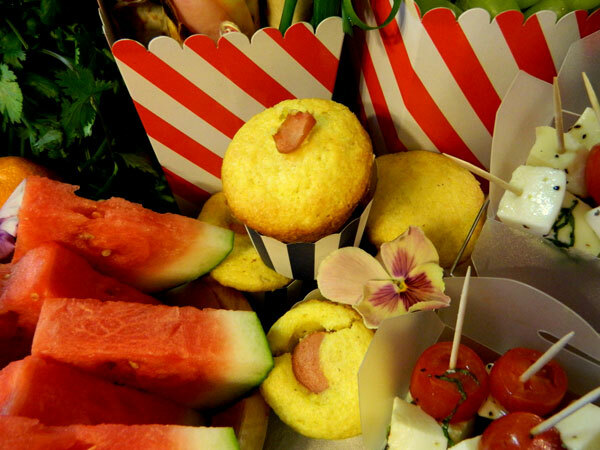 Corn dog muffins are a snap to make and will sit well outdoors for run-by snacking. Juice boxes and bottled water are perfect for a picnic. Simply pop them in the freezer ahead of time, then pack them in your basket or cooler with the rest of the food. They function as ice packs and will still be cold when you are ready to eat. Individually packaged drinks also eliminate the need for glasses or cups. Springtime is short in the South. School is out for just a brief time before the hot summer kicks in, and a change of scenery is welcome after the gloom and gray of winter weather. Now get outdoors and enjoy the springtime beauty right outside your very own backdoor. Pack a picnic, grab a trash bag, and get picnicking! And remember the bug spray. This is Mississippi after all. Preheat the oven to 400 degrees. Spray a mini muffin pan with vegetable spray. Combine the cornbread mix with the egg, milk, and sugar in a medium-sized mixing bowl. Fill each muffin well with about ½ a teaspoon of the batter. Place a piece of the cut hotdog into each well, pressing down on each one. Top each muffin with an additional spoonful of batter, covering the hotdog. Bake muffins for 10 minutes or until the muffins are golden brown. Remove from oven. Run a knife around each muffin and remove the muffins from the pan. Let muffins cool slightly, and either wrap in foil or place in a plastic container until ready to serve. Heat a small skillet over medium heat and spray lightly with the vegetable oil. Place one tortilla in the pan for 15 seconds. Flip the tortilla over and cook for another 15 seconds. Using tongs, remove the tortilla from the pan and transfer to a cutting board. Place a piece of the cheese on the hot tortilla, then a piece of the ham. Roll the tortilla up, and then repeat the process with the remaining tortillas. Tie a green onion around each tortilla if desired. Wash the grapes and dry as many as you think you will need with a paper towel. Thread 6-8 grapes on each wooden skewer. Fill a small Ziploc bag with 1 cup of the frosting. Snip the corner of the bag and gently squeeze to pipe two circles on the first grape of each skewer to make the eyes for the caterpillar. Place a mini chocolate chip in the center of each eye. Remove the ends from the tomatoes and discard. Place the tomatoes and cubed cheese in a small bowl. Whisk the remaining ingredients together and pour over the tomatoes and cheese. Cover the bowl with plastic wrap and refrigerate for 1 hour. When ready to serve, thread one cube of cheese and 1 tomato on a small pick. Top with extra basil leaves if desired. Emily Ellis is a Southern food designer and chef, born and raised in Mississippi, known for creating simple, flavorful, and artful cuisine with flair.